From her hometown in Michigan to her travels abroad, Andrejka has developed the eye of a skilled photographer by documenting the difference light and texture make on the world. She creates a world of enchantment and wonder while balancing the reality of the moment. Her photojournalistic approach blends beautifully with traditional elements. Andrejka�s focus is to capture the type of image that will never go out of style, it will never show it's age; it will always be a timeless work of art�. Just as her clients� special moments are timeless memories. 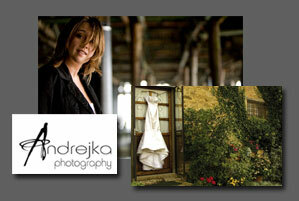 Andrejka has been photographing weddings in Michigan and California on and off for the past eight years, but it wasn�t until the last couple that her business has become her passion. Her work has been featured in a variety of magazines, websites, and marketing ads. Since 2001, Andrejka has divided her time between Mackinac Island, Michigan and her current home of Santa Barbara, California.